Working for The Rouge Partnership, Production AV supplied video solutions to Sky’s internal staff events held in London and Edinburgh. The two day events saw artists such as Tinie Tempah, Calvin Harris, Texas, Eliza Doolittle and Zane Lowe performing for the crowds, alongside performances from various artists and acts from Sky’s own rosta, offering something for everybody. 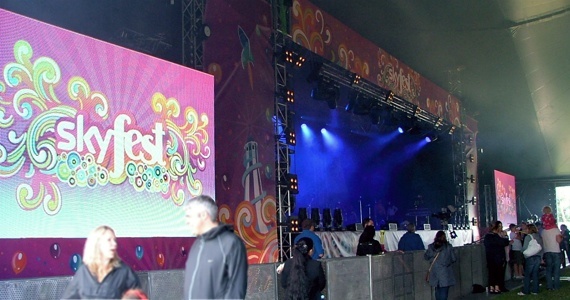 Production AV supplied Lighthouse R7 screens to the main stage and outside the Kayam tented structure to enable the guests to sit outside and enjoy the sunshine while watching the acts. Alongside the LED screens, a full studio camera system was supplied to perform the IMAG tasks and allow for ISO recordings of each channel, enabling Sky to archive and edit the footage for internal uses. The 4 camera package included 30′ jib, tracking dolly and 70x long lens options to give a wide variety of shots and movement for the mix. Various plasma screens we deployed around the venue to enable the VIP guest and those at the bar to keep an eye on the action as it happened. 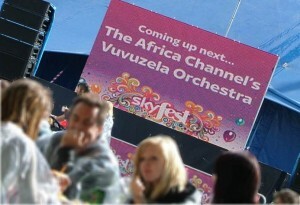 It was a pleasure to be involved with the events, and Production AV very much hope to return in 2012 to work on these events again.